"They like me, they REALLY like me.."
A story that seemed dead in Cleveland media circles came back to shambling life today as the Philadelphia Eagles announced the hire of Chip Kelly as their head coach. More interesting than the hard news is the fallout. Reaction both local and national to Kelly's flip-flop mirrors the strange, defeatist attitude facing the Jimmy Haslam/Joe Banner ownership regime in its first months of operation. The thought that the Browns were "duped," "schooled" or "look bad" for not taking another run at Kelly after initial talks broke down may not be the prevailing position around town, but the discomfiting clamor from Twitter, the blogosphere and professional sportswriters is too loud to be ignored. How do the Browns "look bad," exactly? New owner Haslam and CEO Banner spent seven hours with Kelly, including a two-hour dinner. Due diligence was done, the team made its pitch, and Kelly left for a full-day interview with Philadelphia. 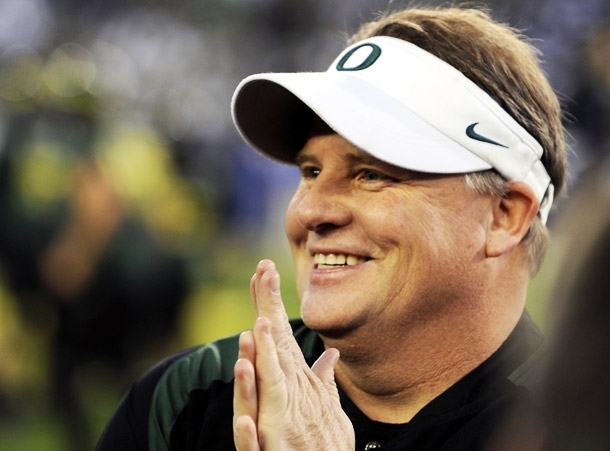 The coach then reportedly rebuffed both teams before heading back to Oregon. The Browns moved on with their search rather than sitting back for two weeks to see if Kelly's suspiciously diva-esque and flaky behavior would allow him to consider an NFL gig after all. Now, the Eagles bombshell, and woe-is-us Browns fans are left holding a 200-bag that goes by the nickname of "Chud." The damnedest thing is, Philly has no more idea what they have in an unproven college coach than the Browns do in a similarly callow coordinator. That's not even the story, however. People are more anxious that the one man the Browns were gunning for apparently slipped through their fingers, meaning...what? Haslam is an incompetent businessman? Banner is a Carmen Policy redux? Neither memorized Alec Baldwin's speech in "Glengarry Glen Ross" about coffee being for closers? We don't know what we're worried about anymore, but we'll be happy as long as we find some reason to wring our hands. This is Cleveland, after all. That's not to say one shouldn't be circumspect about the new ownership group. The Rob Chudzinski hire was oddly timed and I still don't quite understand what the Browns saw in Chud to sign him up as quickly as they reportedly did. What's more, the secretive nature of the coaching search led the media to come up with their own reasons why the Browns couldn't land the big fish they were casting for. This perceived failure only added to the undercurrent of anxiety that seems to underlie the new regime's short tenure. Still, there's no call for using loaded words like "spurned" when it comes to Kelly or for that matter Nick Saban, Bill Cowher or Jon Gruden. The latter three coaches turning down the Browns is not a reflection on team management - these are men happy where they are and not a one of them has had a single interview with another NFL team. Anyone asking Saban to leave Alabama would likely have received the same answer. Instead, we have WKNR's Kenny Roda practically begging ESPN's Chris Mortensen to admit that Chud was near the bottom of the Browns' list of coaching candidates (Mortensen, to his credit, did not rise to the bait). We have people complaining about Haslam selling naming rights to the stadium or talking about uniform changes instead of resurrecting Vince Lombardi to coach up this roster. The NFL's free agency period is six weeks away; the draft is not for months. Yet, the blush is already off the rose for Browns' leadership. Perhaps it's understandable, as fans and media no longer want to hear the tiresome buzzwords of "process" or "patience" or heaven forbid, "rebuild." I don't want to hear those words, either. But Cleveland needs to chill out, sit back and let the new ownership get to work on making the Browns relevant again. There's no cause - at least not yet - to believe they aren't up to the task.